The first generation (shodai) Dewa-daijô Yukihiro (出羽大掾行廣) was called Kurôbei and he was born as the second son of Hashimoto Yashichibyôe Nobuyoshi (橋本七兵衛吉信) in the third year of Genna (1617). He was the son-in-law of Musashi-daijo Tadahiro (武蔵大掾正廣). He was the younger brother of the first generation Kawachi-daijô Masahiro (河内守正廣). Yukihiro (行廣) was born when his older brother, Masahiro (正廣), was eleven years old. Yukihiro’s (行廣) first dated work was produced in the sixteenth year of Kanei (1639) when he was 23 years old. He was awarded the title of Dewa-daijo (出羽大掾) in the fifth year of Shôhô (1648) at the age of 32. In the third year of Kanbun (1663), he was promoted and given the title of Dewa-no-kami (出羽守). Two years later, his older brother, Masahiro (正廣), passed away. In the third year of Keian (1650), two years after he became Dewa-daijo (出羽大掾), he is said to have moved to Nagasaki to study the Dutch method of forging (Orlanda-kitae (以阿蘭陀鍛)) under Hisatsugu (久次) and Yakushiji Tanenaga (薬師寺種永). After that time many of his swords were inscribed with the words, Orlanda-gitae o motte (以阿蘭陀鍛). He is said to have continued his studies together with his fellow student, Harima-daijô Tadakuni (播磨大掾忠国), when he studied the traditions of the Bizen Ichimonji (備前一文字) school under the Edo Ishidô (江戸石堂) smith, Shirobei Noriyoshi (四郎兵衛則吉). After that time, he started adding the kanji character, Ichi (一), above his mei on many of his swords. In Yukihiro’s (行廣) early days while he used the title Dewa-daijo (出羽大掾), he signed either with or without Fujiwara (藤原) in his mei. Common signatures were Hizen no Kuni Dewa Daijo Fujiwara Yukihiro (肥前国出羽大掾藤原行廣) or Hizen no Kuni Dewa Daijo Yukihiro (肥前国出羽大掾 行廣). His mei using Hishû (肥州) or Hishû no Jû Dewa Daijo Yukihiro (肥州住出羽大掾 行廣) are found on his wakizashi or naginata. After he acquired the Dewa no Kami (出羽守) title, he added the character Ichi (一) centralized just below the habaki. After this time, he usually used either a go-ji mei (five-character signature) or a naga-mei (long signature including the province name). His naga-mei usually reads Hizen no Kuni Dewa no Kami Yukihiro (肥前国出羽守 行廣). We also often find a reference to his using Dutch forging in his mei. Such terms as Oranda Gitae o Motte Kore o Tsukuru (以阿蘭陀鍛之作). or Oranda Gitae o Motte Tsukuru (以阿蘭陀鍛作) were used to express this. His dated works are few and it is an important kantei point that his mei always along the left side of the nakago mune. He eventually began to serve Nabeshima Sakyô, a local Daimyo, and he lived in the town of Nagase. It is also said that he went to Geishû Hiroshima to produce swords. He passed away on the twenty-seventh day of May in the second year of Tenwa (1683). SUGATA: They produced mainly shinogi-zukuri katana and wakizashi. Their mune is usually iroi-mune. Most of their katana are formed to have an average width and a medium sized kissaki, but sometimes they are wide with a somewhat extended kissaki. In shinogi-zukuri wakizashi the width is broader and the medium kissaki is longer than in their katana. 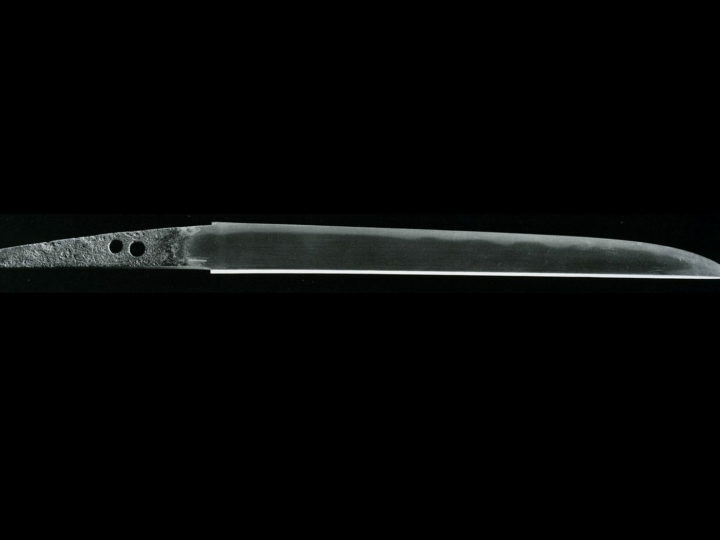 They seldom produced wakizashi in a hira-zukuri style, but when he did they are wider and longer with a thick kasane. Some have a mitsu-mune. JITETSU: Their kitae is a tight ko-itame hada with fine and dense ji-nie, i.e. the typical konuka hada of the Hizen school. Occasionally there will be areas of small mokume mixed in. Their hada will be slightly coarser than the works produced by the mainline Hashimoto Tadayoshi (橋本忠吉) and Tadahiro (忠廣) lines and their jitetsu will have a slightly darker hue. HAMON: Their hamon is either the traditional suguha or midareba. Midareba is more frequently produced with notare mixed with gunome and chôji variations or with chôji-midare mixed with gunome and many long ashi. Occasionally they produced their unique patterns consisting of large midare, which are scarce in other Hizen works. In all instances, their hamon consists of deep nioi with many ko-nie forming sunagashi. It should be noted that their midare contains yahazu-fû patterns stretched sideways, which is a unique characteristic of their works. 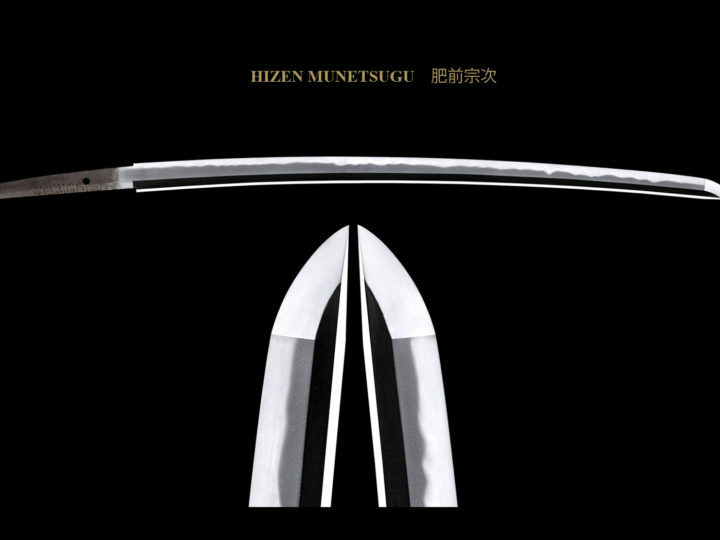 In hira-zukuri wakizashi, they sometimes produced hamon with basically straight but modestly undulating on the lower half of the blade changing to a chôji mixed with gunome and tobiyaki as well as muneyaki in the upper half. This gives it an almost hitatsura appearance. Generally speaking, their ha compositions have a disorderly appearance and lack neatness. 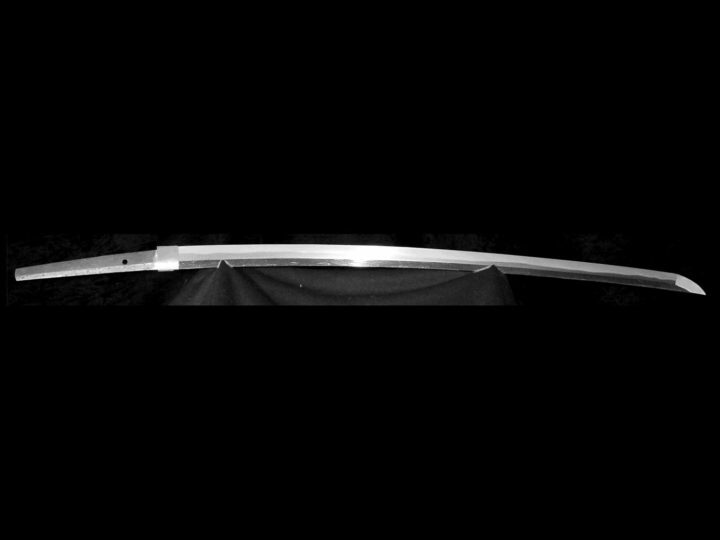 BÔSHI: As with all Hizen blades, the bôshi is usually smooth and follows the shape of the edge ending in a ko-maru shape with kaeri. NAKAGO: The nakago has a kurijiri shape with a swollen end. The yasurimei are sujikai or else ô-sujikai. MEI: The katana mei is written on the sashi-ura (tachi-mei) as is the characteristic of the Hizen school. 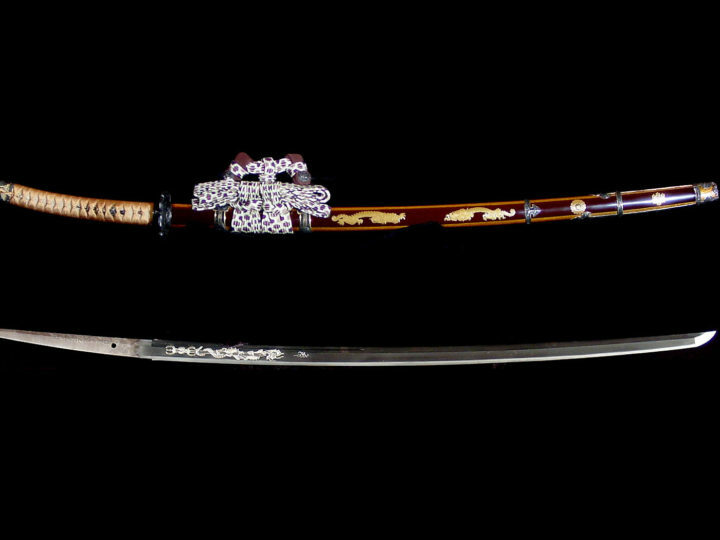 The wakizashi mei is written on the traditional sashi-omote side, however. The second generation (nidai) Dewa-no-kami Yukihiro (出羽守行廣) was the natural son of the first generation. He was called Tôma-no-jô (藤馬氶) and used the mei Yukinaga (行永) at first. He inherited the Dewa-no-kami (出羽守) title in the first year of Jôkyô (1684), two years after the shodai passed away. There are some different opinions as to when he passed away. It is stated in Kokon Kaji Biko that he died in the fourteenth year of Genroku (1703) at the age of 69. This, however, does not seem possible since we have dated works by him from the sixteenth year of Genroku (1703) and the third year of Hôei (1706). The lineage submitted later by the ninth generation Yukihiro (行廣) to the Agency of the Imperial Household gives the eleventh year of Kyôho (1726) as the year of the death of the nidai. This would seem more reasonable. His birthdate is unknown, but based on the custom followed at that time, it is likely that he was born around the time that the Shodai was conferred the Dewa-daijô (出羽大掾) title in the fifth year of Shôho (1648) at the age of 32. It could also have taken place a few years earlier. Based upon this assumption, and if the record submitted by the ninth generation is accurate, he was probably slightly younger than 80 years old when he died. While the Nidai enjoyed longevity considering the average life span at that time, his works are considerably fewer in number than those of his father, the Shodai. This is probably because the demand for swords was lower during the time of the Nidai. Overall the workmanship of the Nidai is like that of the Shodai. Most of his works are katana and wakizashi done in shinogi-zukuri style. He also produced a small number of tanto and naginata. His tanto are hira-zukuri in shape. The Nidai signed most of his works with the naga-mei, Ichi Hizen no Kuni Dewa no Kami Fujiwara Yukihiro (一肥前国出羽守 藤原行廣). Other signatures include Ichi Hizen no Kuni Dewa no Kami Yukihiro (一肥前国出羽守 行廣). and a few were signed Ichi Hizen no Kuni Tôma no Jû Yukihiro (一肥前国藤馬住行廣). Like his father he also sometimes added Oranda no Gitae o Motte Kore o Tsukuru (以阿蘭陀鍛之作). His usual style of chiseling is placing the character Ichi (一) above the mekugi ana and placing the remainder of the mei in the middle of the hiraji of the nakago in large sized characters. As noted, the placement of the mei is different from the Shodai in that the Shodai places it near the mune. However the Nidai’s earlier works, especially those containing the Tôma no Jô (藤馬氶), have the placement near the mune and the chiseling style also resembles the Shodai’s. 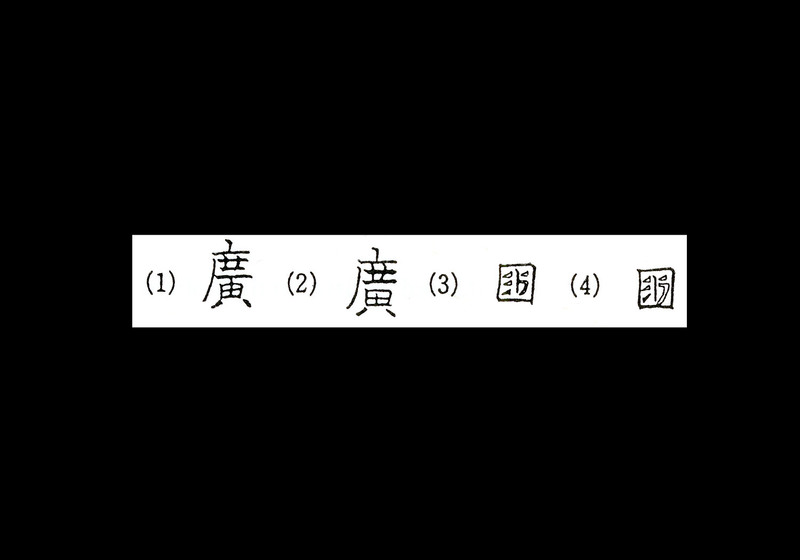 Besides the placement on the nakago, the characteristics that distinguish between the mei of the Shodai and the Nidai lie in the formation of two strokes within the kanji for Hiro (廣) and Kuni (国). Referring to the illustration above, please note that the Shodai’s character for Hiro (廣) is formed like (1) while the Nidai’s is like (2). In regard to the character for Kuni (国), the bottom chisel stroke immediately to the left of the center vertical line in the Shodai’s starts from the right as in (3), while the Nidai’s starts from the lower left as in (4). This brings up some interesting thoughts to consider regarding this month’s kantei blade by Yukihiro (行廣). The tang is shown above. Both the sayagaki and the NBTHK Hozon papers attribute this blade to the Shodai Yukihiro (初代行廣). Close examination of the mei, however, would tend to make one think that this blade is more likely to be an early blade made by the Nidai Yukihiro (二代行廣). If we study the two key kanji above, we find that the Hiro (廣) kanji conforms to number 2 above and the Kuni (国) kanji matches number 4, both characteristic of the Nidai. 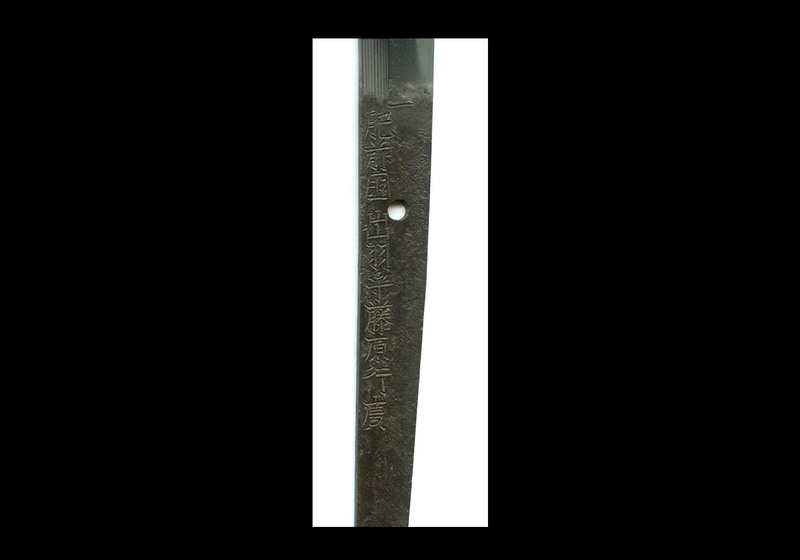 This coupled with the fact that we know that the Nidai signed his early blades with the mei positioned along the left side of the nakago (like the Shodai), leads one to believe that this blade could have been a very early blade made by the Nidai or, more likely, a gassaku blade made by the Shodai together with the Nidai and signed by the Nidai.